The mission of the Michigan Foundation for Vision Awareness (MFVA) is to provide educational outreach to people of all ages regarding their vision and eye health; to award academic scholarships to optometric students; to help fund grants to organizations that support vision related scientific research and to award grants to organizations helping the underserved that promote eye health and well being. You know vision is a gift. That’s why you can appreciate the joy of nearly 700 young Special Olympics athletes receiving prescription glasses. 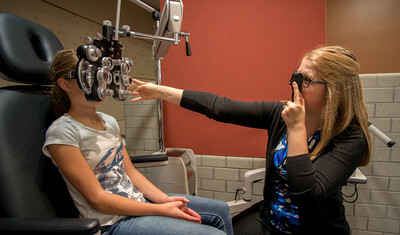 Or knowing that 150 children of Northern Michigan migrant workers received free vision screenings and follow-up care. The Michigan Foundation for Vision Awareness is pleased to partially fund these projects. But we need your financial support to expand our efforts. To learn more and support our efforts in Michigan, consider a donation. In the spirit of staying connected, the MFVA has a Facebook page! Feel free to view our posts, glance through pictures, and post how you are educating Michigan about the importance of eye health and vision. Like our page to show your support for Your Foundation! Support us by contributing to MFVA, by applying for grants to support your vision related project, or by joining the MFVA Board. If you have a vision-related project you need assistance with, please complete our online application for a project or research grant. MFVA Grant recipient Dr. Avesh Raghunandan with MFVA Vice President, Dr. Cynthia Geneva and MFVA Past President, Michael Becker. 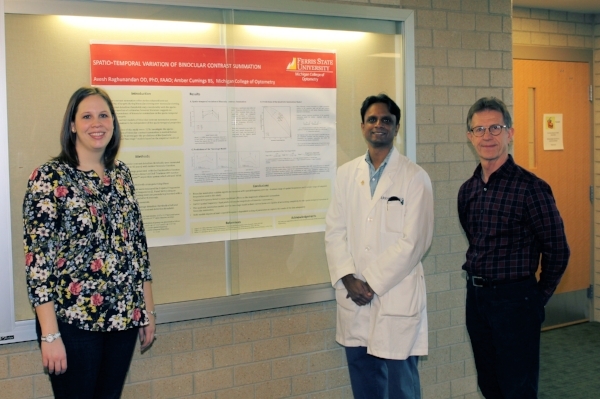 Dr. Julie Marvin-Manders, Lindsey Lewis, Dr. Cynthia Geneva and Dr. Mitch Dobrezelewski. Recipients of first-year optometry scholarship with MCO Dean, Dr. David Damari and MFVA Past President, Michael Becker. The MFVA has awarded nearly $1,000,000 in grants and scholarships since 1995! The MFVA awards grants annually for research and projects. In 2018, grants were awarded to Opening Eyes Special Olympics, Baldwin Family Healthcare for a handheld fundus camera, MOA for Think About Your Eyes and Ferris Futures Challenge Scholarship for first-year MCO students. Scholarships support Michigan first-year MCO optometry students or 3rd year optometry students. The MFVA has awarded $515,000 in scholarships since 1958! MFVA has supported the Student Volunteer Optometric Services to Humanity (SVOSH) with funding of $184,245 over the past 24 consecutive years!